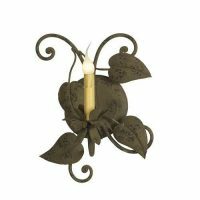 The wrought iron wall sconces are an artistic ornamental wall bracket to hold candles or electric lights or as a hanging wall decor. 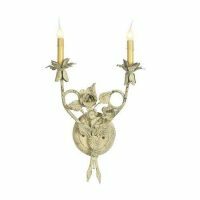 A sconce is a branched decorative lighting fixture supported by a bracket to the wall. The sconce can be connected to an electric source for light bulbs or can be used as a wall candle holder. 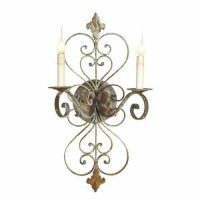 Our wrought iron wall sconces come in a variety of shapes, sizes and with a variety of design accents. 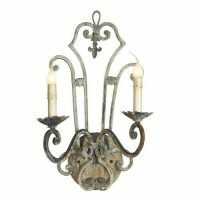 Our sconces can serve as wall hanging decor, candle wall sconces or light fixtures wall sconces. 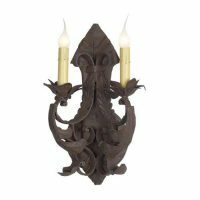 wall sconces complement the design elements of other items of the entire space. Some wall sconces can be selected to complement or contrast with the other colors used in the space. 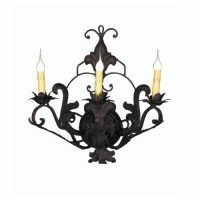 The sconces get ride of the shadows of the central chandelier in bathrooms, living rooms, hall ways and living rooms. Wall sconces can be used in hallways, stairways, museums, building entrance, art galleries, offices, shops, conference rooms, restaurants, hotels, libraries, bedrooms, bed rooms, dining rooms living rooms and toilets.